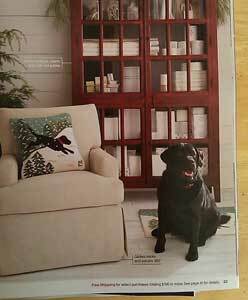 If you read the bright spot, you know how much I love dogs being featured as catalog models. Imagine my joy when I found this furry fellow in the latest Crate & Barrel holiday catalog. Maybe he’s not as elegant as the pashmina-sporting pup in the White House Black Market catalog—but a looker nonetheless. And with a matching pillow to boot. It makes me want to buy that chair! Anyone else see any fetching (pun intended) canine catalog models lately? Please share!